I decided to have children knowing it was going to be hardwork, of course nothing ever comes without hardwork. Obviously I knew the basics of parenthood consisted of having less sleep, a screaming baby, and I knew roughly how to look after one atleast for it to survive. 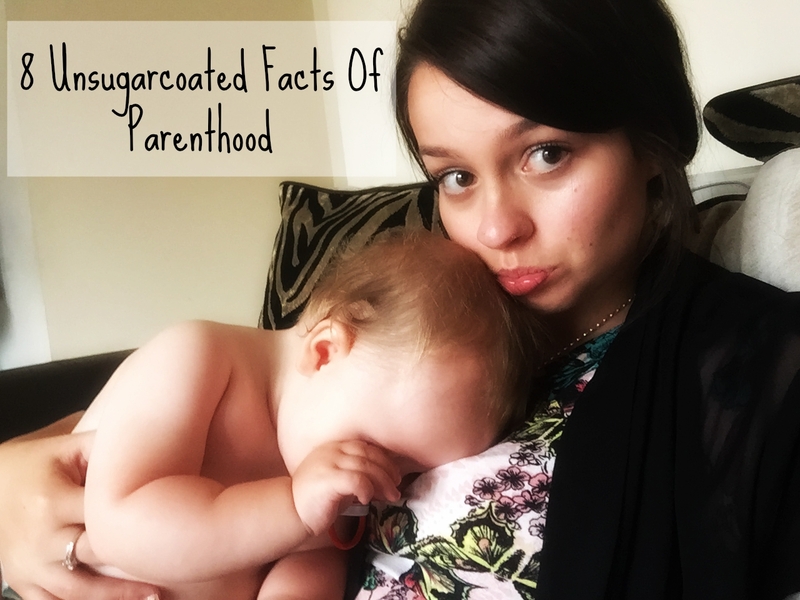 Over the last year its come to my attention that there are but many facts about parenthood they tend to forget to mention. Here's some of the main unsugarcoated ones I've come to the realizations of after just one year I'm almost 100% that i'll discover a whole heap more over the next 16 years. 1. Stench; You will be exposed to poop many times over the first few years and it'll come abit closer than you'd like to hope for. Since day one my nostrils have been violated by horrific smells that make them quiver and cringe. I peel off those tabs on the nappy for my eyes to pop out my head in disbelief that my beautiful baby could create such a monstrous mess. Many times I've sat on the sofa wondering why the heck the stench is following me around 20 minutes after cleaning the dreaded pooey bum, only to discover I've got it all up my forearm. 2. Destruction; It doesn't matter how hard you try to keep a home functional for the family, it will be destroyed quicker than you can clear it up. Only this morning was I making the beds feeling positive about how much housework I had sorted and how easy it was as Penelope was happily playing, only to discover the little sh*t bag had emptied the entire contents of Sudocream onto the carpet and sofa. A mothers work is never done. 3. No personal space; I struggle to remember what this is, imagine being able to brush your hair without a baby clinging onto your leg making sounds like a injured hyena. Times when going to the toilet were peaceful, and those collapse on the sofa moments were not followed by a baby climbing onto the sofa to bounce on your belly. If you want personal space my advice would be...don't have children!! 4.Starvation; It's your main focus to make sure you child/ren are fed properly. You become obsessed with making sure they get all the correct nutrition but yet we forget to feed ourselves and end up surviving through the day picking at the scraps froml ours kids meals. Those left over chunks of soggy sausage is as good as it gets some lunchtimes. 5. Letting yourself go; Making sure your baby is bathed and dressed by 8:30am every morning is part of the daily routine, but your lucky if you get a shower every three days and even luckier if you get to wash your hair that week. Admittedly if things become desperate I start to wonder whether if I were to venture out would I fog up the street with a green cloud of stink? If the answer is yes ill run into the shower while Penelope plays in her ball pit; a self constructed baby prison. 6. Treading on egg shells; Always trying to enforce a solid running family home, setting routine, boundaries and rules for my kid. Yet when it comes down to the it feels like they rule the household. Tip toeing around the house, cringing with fear if a door closes to loudly, or scurrying to the front door buzzer if it goes off nearly cracking your head open on the way, all in the hope you don't wake the baby. Your'll give them what they want 99.9% of the time if it keeps them quiet while out in public just to avoid the dreaded dramatic devil child scenario. 7. Abused: You will be smacked, scratched, bitten and pounced upon. If it has not started already and you think your safe, do not kid yourself, it will come for you whether it be at 8 months or 4. I thought I'd lost my right eye from a scratch attack recently, I woke up the next day feeling like it was going to explode with a blood shot eye. The damage a little person can do at one year old can and will become painful if you haven't got your wits about you. 8. Advanced reflexs; This one is pretty awesome it comes with parental instincts I believe. Somehow at some point you develop the reflexs of a black panther, you can sense a few milliseconds before something dangerous is going to occur, for example you see the baby heading for the scissors accidentally left on the edge of the table as you forget they've grown 3 inches and can now reach. You dive across the sofa pulling all the muscles in your neck on the way, but hooray, you save the day and retrieve the scissors. These reflexs will save your child from such situations many times throughout childhood. I hope you enjoyed that read lovely peeps! Please take it with a pinch of salt it was all meant light heartedly, even though parenthood is tough, draining, and demoralising at the worst of times. It's also the most rewarding job in the world and I would not want to be doing anything else with my life now other than raising my daughter and giving her all the love and care that I can.